It is hard to picture Kobe Bryant in a jersey that doesn't have 'Lakers' on the front of it, but Mavericks owner Mark Cuban yet again painted a picture of just that late last week. During a radio interview in Dallas on Friday, the outspoken owner brought up the idea that the Lakers might have to amnesty Bryant if they re-sign Dwight Howard, due to the newly implemented luxury tax set to take effect next season. The Lakers front office and Kobe didn't take the comments lightly. The organization released an official statement calling them "inappropriate." As for No. 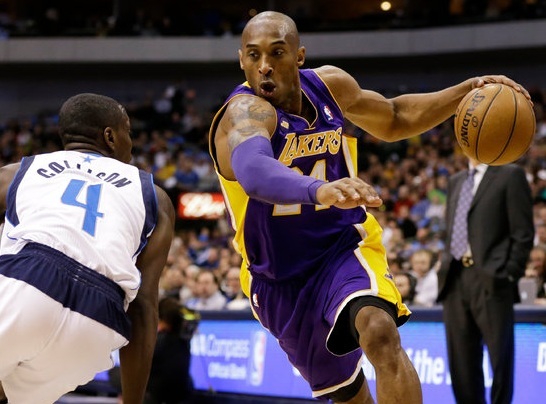 24, it seemed that he used the comments as fuel to lead Los Angeles to victory on Sunday. Kobe went 13-for-21 with 38 points, 12 rebounds and 7 assists, as the Purple & Gold pulled out a 103-99 win on the road over Cuban's Mavs. After the game, the Black Mamba took to twitter and fired back at the brash owner with, "Amnesty THAT." Cuban later responded by tweeting: "Nice to know there is at least one team and their players outside of the Mavs that listen to everything I say. But I do have to give props to @kobebryant for a great tweet. #WellDone." It is well documented that Cuban is actually the one who has some kind of obsession with the Lakers, as he has often made unnecessary comments about the organization and its players and coaches. He always tries to get under people's skin. But Kobe is the last guy you want to try and light a fire up under, especially when he is about to face your team. He feeds off that kind of stuff, and anger only makes him a more dangerous player. While Cuban's hypothetical notion about waiving Kobe would make sense from a financial standpoint, seeing as he is set to earn a little over $30 million next season, it is considered blasphemous to Laker fans. He is one of the greatest players in team history and has been with the organization through thick and thin. There is no way they would do that to him. However, seeing as Bryant's salary will be about half of the team's salary cap, and the luxury tax along with the repeat offender tax will skyrocket next season, the Lakers might have to figure something out. Even if they do not get to re-sign Howard, Los Angeles will reach the salary cap with the other "Big 3's" contracts. Kobe's $30.4 million, Pau Gasol's $19.2 and Steve Nash's $9.3 total a whopping $59 million, which is what the salary cap for 2013-2014 will be right around. Tack on a max deal for Dwight (if he indeed does decide to stay on board) and the fact that they still have 10 other roster spots to pay out, and the Lakers will once again have a team salary exceeding $100 million. That means that they may very well be more than $30 million over the luxury tax line and could have to pay over $100 million in luxury tax to the league. It is understood that the Lakers' mega $3 billion television deal over the next 20 years with Time Warner Cable can cover such a vast penalty tax, but the fact that the $150 million per year the organization would receive from TWC would be virtually paying for only a luxury tax is absurd. I expect the Lakers to make some changes for next year, no matter how prestigious the franchise is. That repeat offenders tax is no joke. If Dwight re-signs with the team, I could very well see them trading Gasol for draft picks or even amnestying the 7-foot Spaniard. Metta World Peace is another player who could get the axe via the amnesty clause. He has a player option, which he most likely will pick up, for his $7.7 million that he can earn next season. And with only Nash signed through 2014-2015, the Lakers might just end up sucking it up for one more year and paying the hefty tax, knowing that in two seasons almost all the money comes off the books and they can basically start over from scratch. There are several routes the Lakers can take to get their salary cap issues taken care of for next season. Anything can happen, and it's definitely going to be interesting to see what they do. But for now, I'm sure the organization is more worried about getting things fixed for this season. It's unlikely, but Kobe COULD end his career elsewhere. Stranger things have happened in sports. No way Kobe goes anywhere. He IS the Lakers.